Jean Désiré Gustave Courbet (10 June 1819–31 December 1877) was a French painter who led the Realist movement in 19th-century French painting. The Realist movement bridged the Romantic movement (characterized by the paintings of Théodore Géricault and Eugène Delacroix), with the Barbizon School and the Impressionists. 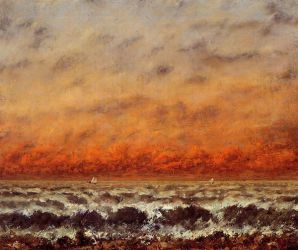 Courbet occupies an important place in 19th century French painting as an innovator and as an artist willing to make bold social commentary in his work.Courbet was admired by many younger artists. Claude Monet included a portrait of Courbet in his own version of Le dejeuner sur lherbe from 1865-1866. 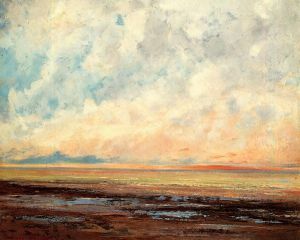 Courbet's particular kind of realism influenced many artists to follow, notably among them the German painters of the Leibl circle, James McNeill Whistler, and Paul Cézanne. Courbet's influence can also be seen in the work of Edward Hopper, whose "Bridge in Paris" (1906) and "Approaching a City" (1946) have been described as Freudian echoes of Courbet's "The Source of the Loue" and "The Origin of the World."